There are just a few days left to make your decision. 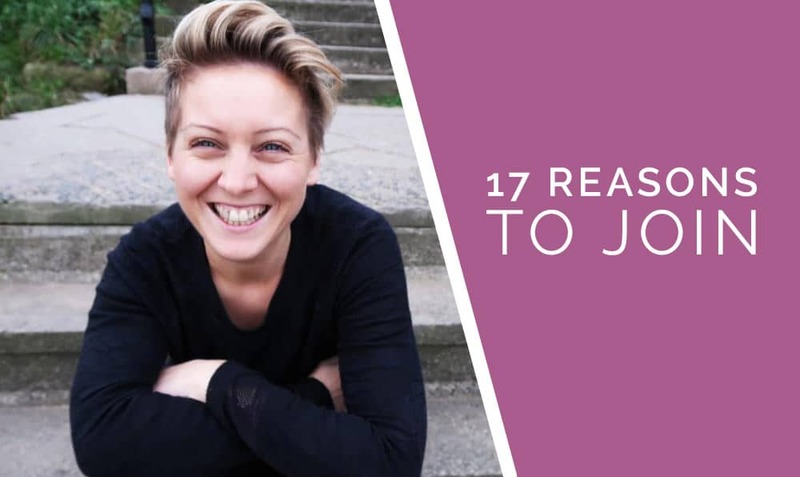 If you’re considering DARETOGROW / The Online Course, let me give you 17 epic reasons to say OH HECK YES, I’M IN! Annnd 4 reasons to say ooh noooo not for me. Erm, I should say…this is a long post but if you’re really thinking about joining the course I thought you might enjoy the detail. The first thing I want to stress is that there is no risk in signing up. When you join, you get 30 days to try out the first few weeks of the course, take part in the Sunday morning Lives on Facebook and complete the exercises in your lovely new workbook. If it’s not for you, not only will I eat my metaphorical hat but I will give you your money back. All I ask is that you watch the first five training videos exercises. I mean you gotta try it right?! Intention counts for a lot but the real key to changing your life is to take acccction every single day. Small consistent steps: that’s how you change your life. When you join The Online Course, you’ll feel a huge focus towards action and this is backed up in a few ways. For one, you get a 100 page workbook that gets you to ‘do the work’. You get an accountability buddy and you’re invited to attend an exclusive live event with me and other members of the course: one massive day of re-wiring, decision making and accctionnnn. When you invest, you’re not just investing financially. You’re making a commitment to yourself: a commitment to turn up for the training and turn up for your dreams. I know life can get in the way of what you really want. With this course you’re saying: ‘Yes, I want to spend an hour each evening on my dreams’ or ‘Yes, I’m going to spend a few hours on my dreams each Sunday’. Enrolling in the course is about saying ‘no to delay and yes to today!’ Oh, wait – that rhymes hehe! I’ve got to mention the fact that this course is BURSTING with proven strategies for changing your life and making a living doing what you love. Not only have I lived through, tested and developed the strategies in this course but the past graduates have too and they are getting huge results in their lives. This course is made up of 50 incredible, life changing units. All complete with videos and focus worksheets to help turn the ideas into action in your life. Boom! And I’m not just teaching theories. If you’ve been following my daily vlog – The Journey – you’ll know that I actually do these things daily and this is how I’m getting results in my life. (iii) how to find peace in the moment so I could stay present and get over depression and anxiety. Each piece of the puzzle is so important and you will find a beautiful spiritual thread running through the course. I’ve included guided visualisations, mediations and key spiritual practices top performers use to succeed. It’s not easy changing your life with no support. That’s why the community aspect of DARETOGROW is so important and so darn special! When you join The Online Course, you get exclusive access to the secret group of movement makers who are working, right now, to build their dream lives. I’ve set up a secret Facebook group and it’s active right now with incredible people, just like you, who are building their dream businesses as I type. The course costs £970 to join and once you’ve paid in full you get lifetime access! If you choose to pay in full, you save £250 bringing the cost down to £720. But if that’s a stretch right now, don’t worry – you can join today for only £97 a month with my monthly payment plan. It’s incredible value for everything you get: 50 video based modules, a workbook, a free live event, the accountability, the weekly Facebook lives, the community, the training…and that time to work on your dreams. Do you know one of the keys to making a living doing what you love? You’ve got to build a product or service and share it so people can buy it. Now hang on. I know that sounds so simple but you’d be amazed at how many people have great ideas but never get them out into the world. * Look at how to build an active and engaged community of super fans who can’t wait to work with you – and you start building it right away! * Work through, step by step, how to build your first product or service. My intention for you is that you LAUNCH it, or a mini version of it during this course. My view is it’s better to get a version out there and build on it than to hide it away until it’s perfect. But, don’t worry…if it’s not the right time for you then you can always come back to this part of the course. That’s another reason why you get life time access. This course isn’t just about purpose and changing your life, both huge and epic topics in themselves…This course is about how to build and market your product or service to make a living doing what you love! But marketing is changing all the time. What worked last year won’t work this year. That’s why I have re-recorded 90% of this course for Cohort 7. Want to know how to film and launch a vlog? I’ll show you. Want to know how to build a community online? I’ll show you. Want to know how to sell out a live event with the perfect attendees? I’ll show you. Everything I teach you comes from practical experience. No theory without results. I’ll show you the theory, the practical steps and the results. Let’s go a step further…In this course, let me share with you the EXACT strategy and all the key techniques I use to market and grow DARETOGROW: my community, the course, my speaking events. DARETOGROW is my third six figure business. It’s easy ‘making money’ but what’s hard is making a living doing what you love. It’s a whole new ball game! Let me show you how to uncover your purpose, build a life around it and support that life by making a living DOING WHAT YOU LOVE. After all, what is life for? I do love an online course – you can access it from ANYWHERE in the world and even on your mobile and tablets. But, it’s nice to write things down isn’t it? That’s why I’ve created a chunky, jam-packed 100 page workbook to go with the course. When you sign up, I’ll send you a welcome pack in the post, complete with your very own workbook; brand new for 2018. How many online courses do you know that do that? When I interviewed past graduates of the course, I was surprised to learn that the thing they loved most was the bonus Facebook lives I started running on Sunday mornings. Here’s the deal: wake up and join me live on Facebook for 8am. I will cover a new topic with you or delve into some more detailed training on a tricky topic – How to Quantum Leap, for example 😉 – and you will leave feeling pumped, excited and ready to take massive action in the next 7 days. Plus, it will still only be 9am on a Sunday morning whaat?! (13) BUILD YOUR OWN WEB SITE – FREE BONUS COURSE! Oh this is one heck of a bonus…get this: I am going to teach you how to build your very own web site in WordPress. And I’m going to give you a free domain and hosting for 12 months. Whaaaatttt. I must have ‘rebuilt’ the DARETOGROW web site 10 times in the last two years. As my ideas evolved, so did my web site. I can’t imagine how costly that would have been if I didn’t know how to build web sites myself. And that’s why I’m going to teach you how to build your very own web site so you can edit and update your web site as many times as you need to without spending a penny. Well of course! When you sign up, you get LIFETIME ACCESS to DARETOGROW / The Online Course. And get this…when I update it, add to it and even add new courses, you get access to all of that too! Shh…I’ll be adding a brand new course called ‘How to Vlog from Start to Finish’ in July. You’ll get that too!! In the last month me and Alice have run a live event, fed robins in the snow, walked my dad’s dog along the beach, planned a trip to LA, booked a cottage in the Cotswolds and even decided to move to a new flat! All because we decided, three years ago, to build online businesses that would give us the freedom to live our lives as we wanted. I’ll show you how to build a vision of the life you want and then build a life around it. For real. And a major part of this is learning to trust your own inner voice and release the expectations of others. I’ll show you how to do that in the first part of the course. Oh yes, let’s not forget this! There is a group of people out there right now waiting for exactly what you have to bring. Yes, you! What makes your purpose unique is your story. Let me show you how to tell your story, build your own product or service and share it with likeminded people. In April or May (we’ll choose the date together!) I’ll be hosting a live training day in Manchester, exclusive to members of this group. It will be a transformational event designed to get you in a peak state and make key decisions to change your life. Plus, come along and meet the people you’ve been chatting with in the community. You want to change your life but you’re not ready to do the work and make changes in your life. If you watch the videos without taking action, you will ‘know’ more but your life won’t change and you’ll find that frustrating. If you already have a really clear vision and a step by step roadmap for getting exactly what you want in life then the course isn’t for you. Yes, you’d learn lots of new ideas and have access to the fab community but if you already have a clear roadmap for building your dream life this isn’t for you. If you’re certain that a leopard can’t change it’s spots and you’re not in control of what happens to you then please don’t join the course. You’ll come in looking for ways to prove you can’t change rather than ways to work with these life changing strategies. I believe whole heartedly that anyone can change their thought patterns, their habits and their life. I’ve done it. If you don’t believe that, you won’t have a good time in here! If you flat out don’t believe any of this stuff then you won’t enjoy the course. I think a lot of people misunderstand these concepts and so doubt them because they don’t get results. I teach people properly how to use them and I believe very much in the law of attraction: we don’t get what we want in life; we get what we are. If you don’t believe this, you won’t be able to work with the exercises in this course. Of course, if you love the ideas I’ve shared above and you’re ready to step up and take action on your dreams then this is the PERFECT course for you. Let today be the day you take a punt on yourself, invest in your dreams and commit to building that life you want.